This board is a working pull from my home server which was using this dell xps 435mt motherboard. Supports LGA 1366 processors, I've been running it with an i7920 for about 8 months now. I need to expand my server, need more sata ports and a bigger case for more hdds so I'm selling this board. Works just fine, it IS a Dell board mind you so its bios are pretty much locked down minus boot selection, raid control, and enable/disable Stepping and Hyperthreading. The Bios have been flashed to the latest revision. Asking price is 80USD + shipping (cheap for an x58 board) Also can be flexible. Here is a partial spec sheet. To sweeten the deal I will also include that pci-e 1x SATA II card which has two extra SATA ports on it. Note: This is a mATX form factor board. Also, I do not have the I/O panel for this board because there never was one. The original case just had holes punched in sheet metal. 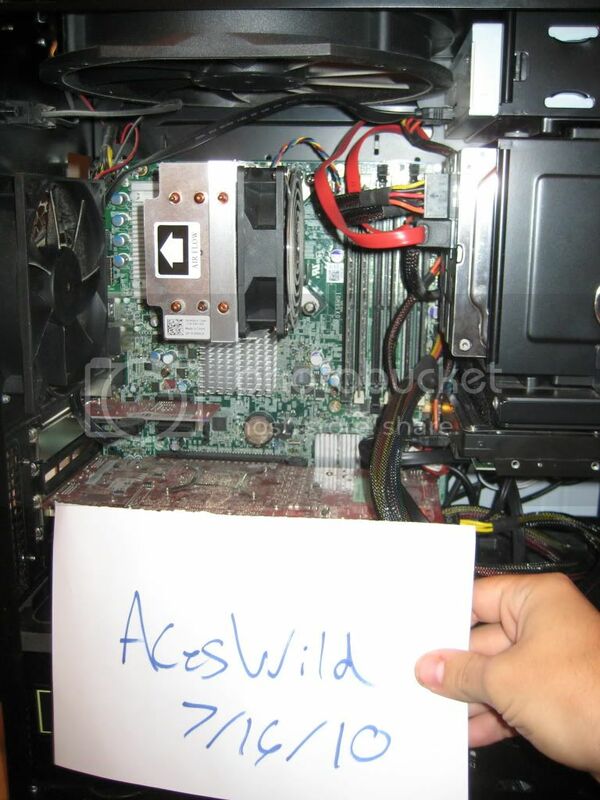 Here's an image of it still running in my case. Another side note if you want some laughs, that hdd you see closest to the video card is actually being suspended by industrial strength velcro lol.